One of the most popular questions I receive is, “how do you wash bed pillows?” If you’ve ever asked this question or wondered if you can wash your bed pillows, this post is for you. 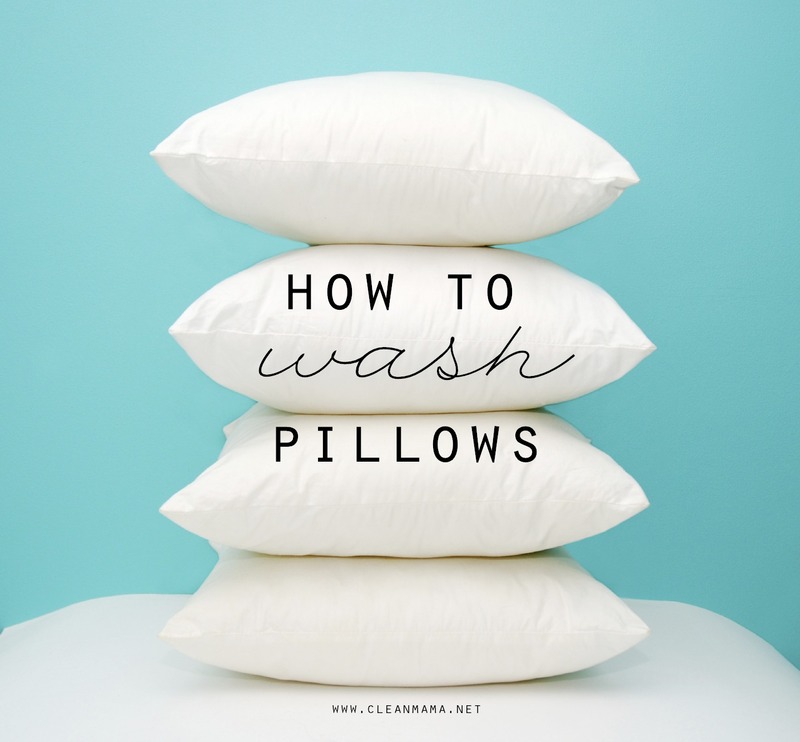 Not only can you wash your bed pillows, it’s pretty simple! Two simple steps and a little time and you’ll be sleeping on clean, fresh pillows in no time! If you have feather or synthetic pillows, you can wash them. Foam pillows are the only kind of pillow that you don’t want to launder – feel free to try washing them in the washing machine but do not dry them – they’ll melt and disintegrate. Remove the pillowcase and pillow protector (if you don’t use a pillow protector, go and get one). You will want to use the most gentle detergent you have, avoiding harsh detergents. Set your washer on a gentle, warm water cycle as well as its largest capacity. Wash at least two pillows (to balance the machine) and no more than three pillows at a time to guarantee a thorough cleaning. After your washer has completed it’s cycle, run it through the rinse cycle again. This is to make sure that all the detergent is removed from the pillow. I like to run my spin cycle twice as well to remove any excess water and help the pillows dry a little more quickly. Once your pillows are washed and the excess water has been wrung out, you can toss them in your dryer. If your pillow is foam, you will want to line dry or hang your pillow to dry as a trip through the dryer would cause the material to melt. For other synthetic materials, dry on a low to medium heat cycle and avoid any high heat. Down and natural materials can’t stand much heat, so set your dryer on Air or Low and allow them to dry thoroughly. If you would like to fluff up your pillows again, put a couple tennis balls in some socks and toss them in to agitate and return the fibers to their natural state. Stop the dryer every 30 minutes or so to rotate the pillows around to make sure that they dry thoroughly and evenly. With a little extra attention, your favorite pillows can feel like brand new again. So go ahead – wash and dry them and look forward to a good night’s sleep. I never really thought to line dry them. I may have to wash them and then line dry them. I’ve tried washing pillows before and everything inside would get all clumped up and the pillow never felt the same. But maybe I was doing it wrong. I have never had any luck with this….and this is the way I have always done it. That’s too bad – I can’t believe what a difference it makes in my pillows! Becky, what type of pillows do you buy? I have a hard time getting just the right pillow and would like to be able to wash it without it getting all deformed. Amber, I have the exact same issue. I think my next question would be whether they are using a front load or top load machine, how do I believe I’ve used both and have yet to have a pillow come out correctly. Very frustrating. I’ve tried this before, too, and I think the question is — Becky, where did you buy your pillows? Because obviously they are awesome. Maybe I’m settling for the cheap brand and that’s the issue?! I have feather/down pillows – Ralph Lauren as well as Target brand synthetic and Costco synthetic pillows – and all have washed up beautifully! This answers my question above, thanks! What about washing a comforter, what is the process? I use the same process and just wash one comforter at a time. Can this be done with memory foam pillows? Would you suggest using the same method for memory foam that is used on the mattress? I wash mine in the bathtub. Just sqish it around to agitate, unplun & let drain awhile so most water comes out of foam. Folding it up & pressing gets most water out, line dry. I put an extra curtain rod over the center of my tub for an indoor line. Before you wash your pillows put five or six stitches through the pillow to stabilize the inside of the pillow. It would be like tying a quilt. Then wash and dry. Unclip the stitches and voila. The pillow is clean and there are no clumps to straighten out. Plump and put on your bed. That is a BRILLIANT idea, Susan! What about ISO cool contour pillows? I do not think they are washable…. Is this the process for both standard and front loading washers? I have a front loader. Same process but you’ll only be able to fit 2 in your washing machine. What if you don’t have tennis balls? Do you have a suggestion for someone on a tight budget that can’t run out for tennis balls? Have Calvin Klein foam rubber pillows and they wash and dry like a dream! Such a great post! Love this, I will have to try this today when I wash my bedding. Thank you so much for this post! I have always washed our pillows- my mom and grandma did this too when I was growing up. Some do get bunched up in the wash, but you can usually unbunch them fairly easily ( and with some patience). My husband thinks I am being “cheap” by washing them, but honestly nothing is wrong that a good washing won’t fix. I have washed feather/down pillows and dried them with a pair of clean running shoes bouncing around. It does a good job of fluffing then up. Then on a sunny Summer’s day I would hang then out to finish the drying. I sometimes put them out on mild Winter days to get that lovely Spring fresh smell. I have some old pillows with a dark yellow-ish color on part of them (not urine, but still, gross color) and I washed them as suggested and it’s faded a little but still there. Would you recommend adding vinegar or something like that to the wash? Any thoughts? Thanks! I have had good luck soaking in Biz. It helps if you can squeeze out all of the air before putting the pillow in the (hot) solution. Also, you may need to rotate the pillow every once in a while, especially if there are big air bubbles. This worked great today!! Thank you for sharing! How often do you do this to your feather pillows? I was nervous to try but bit the bullet today because they were getting so dingy. I also need to get pillow protectors, do you have a suggestion for that as well? I followed this exactly and it worked great on my pillows! They weren’t clumpy at all. Can I wash mulberry silk pillows like this? I’d follow the directions on the pillows – I’m guessing no?